A whey protein shake can serve as a nutrient-dense boost after a workout or as a quick meal when you're on the run, says nutritionist and Precision Nutrition contributor Ryan Andrews. And, when used along with a balanced, low-calorie eating plan and a regular exercise program, a shake may also help you lose weight. 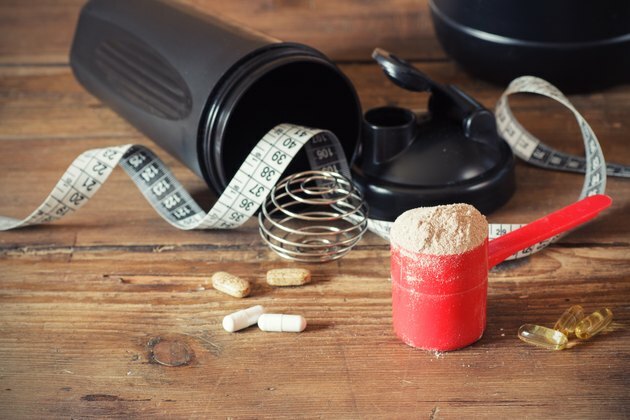 Women planning to use whey protein shakes as part of a weight-loss strategy should speak to a doctor or dietitian first to ensure the plan will provide all necessary nutrients. This is especially true if you're pregnant or nursing, planning to become pregnant or have a chronic medical condition like diabetes. A 1,800-calorie whey protein shake diet plan for a woman could replace two meals, such as breakfast and dinner, with shakes. Fill out the rest of your day with low-calorie, nutrient-dense snacks like nuts or raw vegetables and a meal containing lean protein, whole grains and fresh produce. Alternatively, replace one meal and two daily snacks with half-shakes. For example, you might have a protein shake for breakfast followed by grilled chicken on leafy greens for lunch and broiled fish with vegetables and salad at dinner. Have half a shake at your midmorning snack and the other half in the afternoon. For a diet-friendly whey protein shake, skip the store-bought options, which are usually expensive as well as high in sugar, preservatives, artificial flavorings and colorings and low in vitamins, minerals and fiber, says Andrews. Instead, make your own with a liquid like water or nonfat plant milk, plain whey powder, vegetables like spinach or kale, fruit such as bananas and a source of heart-healthy fats like unsweetened nut butter, nuts, chia seeds, flax seed oil or fish oil. For long-term, sustainable weight loss, a woman shouldn't rely solely on controlling her calories with whey protein shakes. The best way to lose weight and keep it off while enhancing health is to reduce your intake and increase your activity level. According to the Centers for Disease Control and Prevention, healthy adult women between 18 and 64 years old should aim for two hours and 30 minutes of moderate-intensity aerobic activity or one hour and 15 minutes of high-intensity aerobic activity weekly, along with at least two sessions of muscle-strengthening exercises. Brisk walking qualifies as moderate-intensity exercise, while jogging or lap swimming is high-intensity. Women 65 and over can follow the same schedule as long as they don't have any limiting medical conditions. Women who are vegans or strict vegetarians or who have trouble digesting the lactose found in whey protein powder can substitute egg protein powder or vegetable powders like soy, rice, pea or hemp powder in their protein shakes. If you try a whey protein shake diet and you experience bloating or flatulence, try switching the brand or type of protein powder you use. Be careful not to reduce your caloric intake below 1,200 calories per day. Doing so could leave you with little energy and possibly lead to nutritional deficiencies. Ask your doctor for help revising your weight-loss strategy.